Wonderdrug's debut album, Hi!, is available nationwide. The album is the result of three years of writing and recording at the band's The Pop Machine studios. 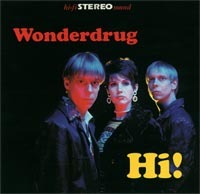 The songs on the final tracklisting were picked from thirty-two Wonderdrug originals recorded. Plus a special hidden surprise! the track also appears in Dreadnought Films' "The Haven" (2000) and can be heard on the Jeff McKlosky Agency's "Bridge Sampler" (September 1999) servicing 120 stations for the Modern Rock specialty airplay format. "Supersonic Daydream" licensed to Monsoon Car Audio for national television ad campaign. The spots aired on VH1, CNN, A&E, ESPN, and TNT. Space Out appearing on: "Take that Theodore" - The 1996 Crossroads Compilation on Gravelsause Records. "Mosquito" appearing on "Ate Up" - The 1997 NUVO Magazine compilation. Read the NUVO Magazine Article about Wonderdrug's Hi! (including interview with Marc and Eric) that appeared both on Nuvo Online and MTV's website. Written by Steve Hammer. Wonderdrug has also had information appear about them many times on the in between video screens on M2. Hi! should be available either on the shelves or by special order in most records stores across the country now! Hi! is available at CDNOW click here for a direct link. Hi! is available at Amazon.com click here for a direct link.